Not to sound like a broken record, but I have another tip I learned from Dorie Greenspan’s blog last week. She wrote about a new website called No Take Out. Susan Herrmann Loomis is one of the contributors. She is another cookbook author that I’m a fan of. I have all of her cookbooks. This site has a daily menu for a dinner that is relatively quick to put together. If you sign up for the email, every morning (for me, usually before I leave for work), you receive an email with the day’s menu. They break it down to ingredients you might need to pick up on the way home, ingredients you probably have in your pantry, and step by step instructions to pull the meal together once you get home. The only thing I’m not wild about is the way they write the ingredients and instructions. Everything for all the components of the meal is jumbled into one list. The steps are in order, but I had a hard time visualizing how each part would come together. 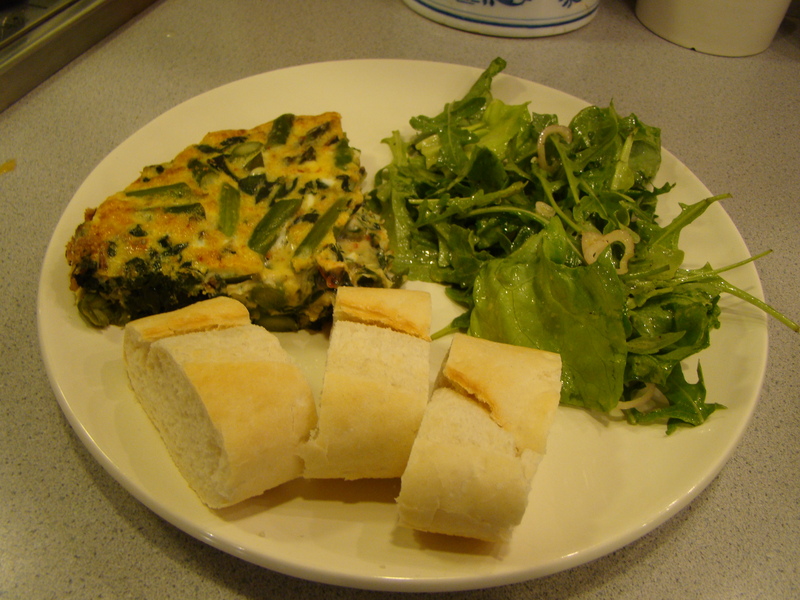 Swiss Chard Frittata served with steamed asparagus & a big spring salad & crusty bread. I used this as a guide, but changed it around a little bit. I had some baby arugula, so I mixed that with the Boston lettuce for the salad. I also prefer my vinaigrette with a 2:1 oil to vinegar ratio rather than 4:1, so I made the dressing my way. One other thing I changed up was to cut the asparagus into 1 to 2-inch lengths before steaming. 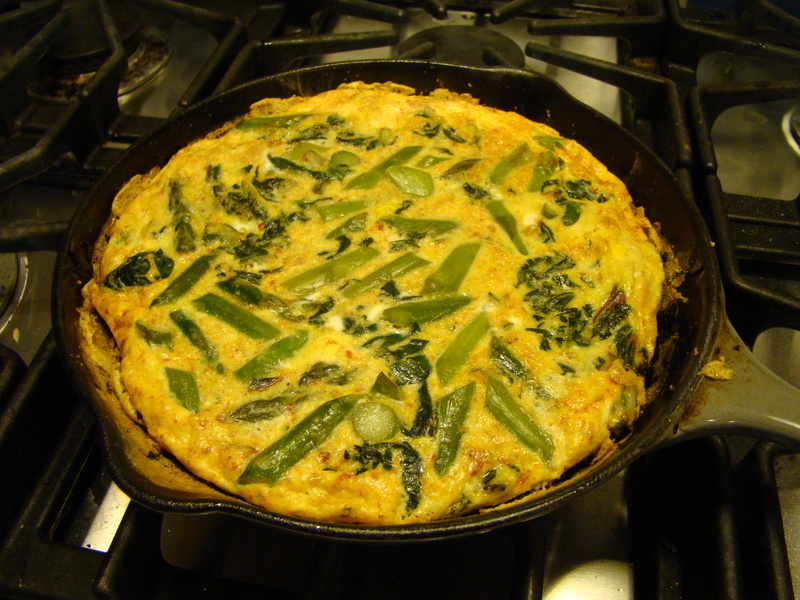 Then, instead of serving the steamed asparagus on the side, I added the asparagus to the frittata. Not counting the stop for vegetables at Wilson Farm, dinner was on the table within 45 minutes of arriving home. The meal was delicious, and we had the leftovers for lunch the next day. I’ll definitely be trying another dinner from No Take Out the next time one piques my interest. Check it out and give it a try. To prepare the Swiss chard, cut the leaves away from the stems. Chop the leaves coarsely. Rinse well. Do not dry – let the water cling to leaves. Heat 1 Tbsp olive oil over medium heat in an 8-inch ovenproof skillet. Add the minced garlic and sauté until fragrant, about 1 minute. Add the Swiss chard, and stir to combine with the garlic. Cover, and cook until the greens are very wilted, about 15 minutes. Stir occasionally to be sure the greens aren’t sticking to the pan. While the greens are cooking (or before you start), steam the asparagus until tender, about 5 minutes. Add the asparagus to the wilted greens in the skillet. Add 1 Tbsp olive oil to prevent the eggs from sticking. Preheat the broiler. Whisk together the eggs, Parmesan cheese, paprika, and salt & pepper to taste. Pour the eggs into the skillet. Stir with a rubber or silicone spatula so the eggs get under the vegetables. Cook until the eggs are set on the bottom, about 5 to 7 minutes. The eggs will still be runny on the top. Place the skillet under the broiler until the top is lightly browned and the eggs are cooked on top. Let the frittata cool for a few minutes. Then, cut into quarters and serve. Serve with salad and crusty bread. To make the dressing, whisk vinegar and mustard together. Slowly whisk in the oil. Add salt & pepper to taste. Wash the salad greens well, and spin them dry. Place the salad greens in a large salad bowl. Top with the sliced shallot. Add salad dressing and toss well. Posted on 19 May 2010, in General and tagged asparagus, eggs, salad. Bookmark the permalink. Leave a comment.